I’m really talking more along the lines of the airy and delightful communal pancake, the Dutch baby. I argue for giving this pancake take a savory spin after having eaten this Savory Pumpkin Spice Dutch Baby. Because if a savory breakfast waffle is awesome, and a bowl of savory breakfast oatmeal is awesome, reason suggests that a savory breakfast pancake should likewise be awesome. Pumpkin spice needed a new directive anyway, it’s starting to get on people’s nerves. I feel like giving it a savory reinvention might help on that front. Plus, all of the toasty, comforting spices contained in the pumpkin spice blend (cinnamon, ginger, allspice, nutmeg, and cloves) really shine when applied to savory scenarios. We ought not overlook that. Let us not forget, September is THE month to get on top of your breakfast for dinner game, and putting some vegetables on this thing makes it feel like a more viable dinner candidate. Adding savory toppings makes for a stunning presentation, with lots of bright color and texture, and makes this pancake feel like a slightly more substantial dish since you have protein and greenery on it. 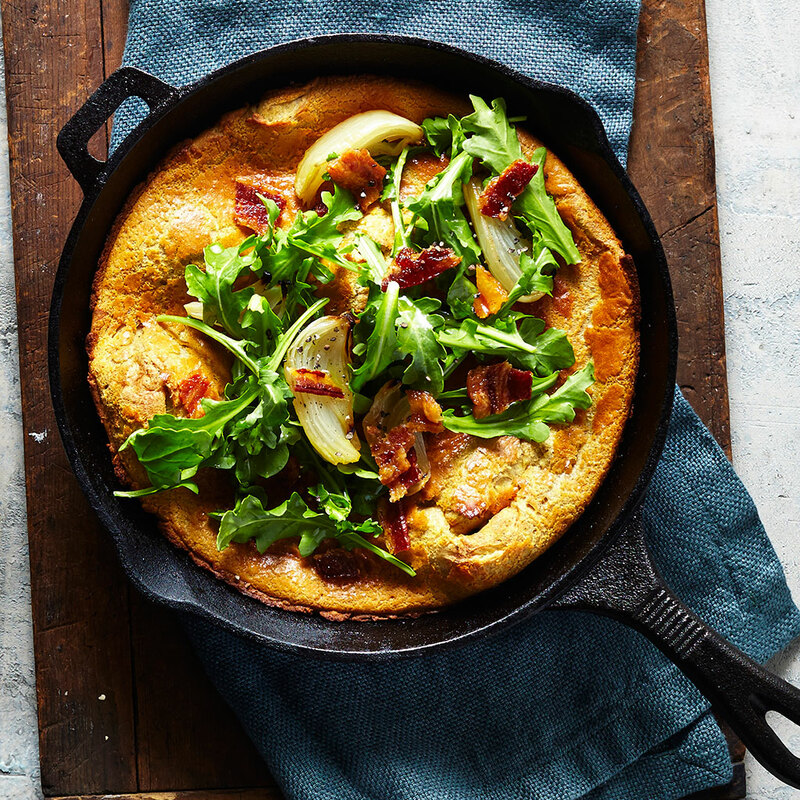 The Dutch baby is an excellent choice for a family or small group brunch because you can pour all your batter in a single skillet that you can just toss in the oven (no flipping skills necessary here), then have a big ol’ bubbly pancake to cut up and share. Now, if you’re not on my team about the savory thing–no worries, you can easily convert the Dutch babe above into a sweet pumpkin spice pancake. Simply substitute sugar for the black pepper in the pancake batter, ditch those savory toppings, and replace them with something sweet like a Maple-Apple Compote and some toasted pecans.